France has decided to sharply scale down its ASTRID fast-reactor project, which is supported by Japan. France’s decision underscores afresh the dismal outlook of Japan’s plan to continue the development of fast-reactor technology by relying on an overseas project. Now that it has become unclear whether participation in the ASTRID project will pay off in future benefits that justify the huge investment required, Japan should pull out of the French undertaking. Fast reactors are a special type of nuclear reactors that burn plutonium as fuel. The ASTRID is a demonstration reactor, the stage in reactor technology development just before practical use. The French government has said the Advanced Sodium Technological Reactor for Industrial Demonstration, if it comes on stream, will generate 100 to 200 megawatts of electricity instead of 600 megawatts as originally planned. Paris will decide in 2024 whether the reactor will actually be built. Japan has been seeking to establish a nuclear fuel recycling system, in which spent nuclear fuel from reactors will be reprocessed to extract plutonium, which will then be burned mainly in fast reactors. When the Japanese government in 2016 pulled the plug on the troubled Monju prototype fast-breeder reactor, which was at the technology stage prior to that of a demonstration reactor, it decided to make the joint development of the ASTRID the centerpiece of its plan to continue the nuclear fuel recycling program. The government will provide some 5 billion yen ($45.2 million) annually for the French project through the next fiscal year, which starts in April, and decide, by the end of this year, whether and how it will be involved in the project after that. Because of significant differences in the roles of prototype and demonstration reactors, a simple comparison between the Monju and the ASTRID can be misleading. But it is clearly doubtful whether the ASTRID, which will be smaller than the Monju, will offer sufficient benefits for Japan’s fuel recycling program. If it fully commits itself to the joint development of the ASTRID in response to France’s request, Japan will have to shoulder half the construction cost, estimated to be hundreds of billions to 1 trillion yen, and assign many engineers to the project. But these resources could end up being wasted. Over the years, the government spent more than 1.1 trillion yen of taxpayer money on the Monju, designed to be a small-scale example of the potential of the fast-breeder reactor technology. But the prototype reactor remained out of operation for most of the two decades after it became operational. It actually accomplished only a small fraction of what it was designed to achieve. The government should make an early decision to end its involvement in the ASTRID to avoid repeating the mistake it made with the Monju project, which was kept alive at massive cost for far too long as the decision to terminate it was delayed for years without good reason. The government has only itself to blame for the current situation. Despite deciding to decommission the Monju, it stuck to the old fuel cycle policy without conducting an effective postmortem on the Monju debacle. Instead, the government too readily embraced the ASTRID project as a stopgap to keep its fast-reactor dream alive. The government needs to rigorously assess whether it is wise to continue developing fast-reactor technology. Producing electricity with a fast reactor is costlier than power generation with a conventional reactor that uses uranium as fuel. The United States, Britain and Germany phased out their own fast-reactor projects long ago. France has continued developing the technology, but feels no urgent need to achieve the goal. The country predicts that the technology will be put to practical use around 2080 if it ever is. Even if Japan wants to continue developing fast-reactor technology, it would be extremely difficult to build a demonstration reactor for the project within the country given that even finding a site to build an ordinary reactor is now virtually impossible. The government would be utterly irresponsible if it aimlessly keeps pouring huge amounts of money into the project when there is no realistic possibility of the technology reaching the stage of practical application. If it abandons the plan to develop fast-reactor technology, the government will have to rethink the entire nuclear fuel recycling program. Any such fundamental change of the nuclear power policy would have serious implications. But there is no justification for postponing the decision any further. Why does Japan persist with dangerous, unnecessary nuclear Rokkasho reprocessing? Is it to enable nuclear weapons? There is a nuclear fuel cycle center in Rokkasho village, located at the tip of Shimokita Peninsula in Aomori Prefecture, in the northernmost part of the main island of Japan. The nuclear fuel cycle center of Rokkasho village is operated by Japan Nuclear Fuel Limited (JNFL), notorious for its incompetent management. In October 2017, the Japanese Nuclear Regulation Autority (NRA) reported that JNFL violated safety measures. As the Mainichi Shimbun reported in an October 11, 2017 article, safety records were faked at the unfinished reprocessing plant. “The NRA concluded on Oct. 11 that Japan Nuclear Fuel Ltd. (JNFL) has violated safety measures after it was learned that the firm failed to carry out the required checks and nevertheless continued to write down “no abnormalities” in safety check records. There has been a spate of incidents such as the flow of rainwater into facility buildings at the plant in the Aomori Prefecture village of Rokkasho. The Japanese government obstinately pursued a fast breeder reactor program, even though other similar projects had been abandoned elsewhere in the world. An estimated $9 billion was spent on Japan’s Monju prototype breeder reactor, which was so troubled it operated only 250 days during its 22-year existence. It was finally abandoned permanently in December 2016 and the decision was taken to decommission it. And yet the Japanese government persists in trying to start operation of the Rokkasho reprocessing plant in the first half of 2021, even though the prospect of the fast breeder reactor’s commercialization has become improbable. There is a contradiction here. Why start a reprocessing plant when there is no usage plan for the end product? One possible reason is that for quite some time, former Liberal Democratic Party (LDP) ministers have been hinting at the possibility of having nuclear weapons. Reprocessing extracts plutonium from irradiated reactor fuel. Perhaps the real intent is to have such a plutonium extraction plant which can produce eight tons of plutonium annually. If the Rokkasho reprocessing plant is put into operation, it will create a surplus of eight tons of plutonium annually. The possession of such an amount of plutonium will most certainly increase tensions in Asia. Japan is riddled with geological faults, and there is no stable stratum including at the Rokkasho reprocessing plant site. A large, active fault about 100 km in length lies on the Pacific Ocean side. Scientists warn that in the case of a big earthquake, a magnitude 8 tremor could seriously damage the reprocessing plant. The operating company insists that a big earthquake will not occur in Rokkasho, but their seismograph is installed on bedrock, and is set so that it does not indicate more than a seismic intensity of 3. Why? It is because when seismic intensity higher than 3 is detected, it is necessary to make a total inspection of the reprocessing plant. ② Hakkoda and Towada volcanoes are nearby …. ③ Fighter jets fly near Rokkasho ….. Possibility of a serious accident ……. After the Fukushima Daiichi nuclear accident, many tanks were created on the site of the Fukushima nuclear power plant to store the tritium contaminated water after processing the radioactive water by the multi-nuclide removal facility (Advanced Liquid Processing System). In Fukushima prefecture, tritium contaminated water is not discharged into the ocean due to opposition from fishermen. In contrast, the same tritiated water was released in large amounts in Rokkasho during the active testing. Fishermen in Iwate once demanded that the reprocessing plant drainage be discharged into Mutsu Bay and not into the Pacific Ocean. The person in charge in Aomori Prefecture refused, saying, “Mutsu Bay would die”. An upcoming mayoral election in Rokkasho Village could have important repercussions for the reprocessing plant. One candidate— Junk Endo — is resolutely opposed to opening it. The election takes place on June 24, 2018. June 13, 2018 (Mainichi Japan) TOKYO (Kyodo) — Japan’s nuclear watchdog on Wednesday approved a plan to scrap a nuclear fuel reprocessing plant northeast of Tokyo over a 70-year period with the cost projected at 1 trillion yen ($9 billion). The facility in Tokaimura, Ibaraki Prefecture went into operation in 1977. It was Japan’s first spent-fuel reprocessing plant built under the nation’s nuclear fuel cycle policy, which aims to reprocess all spent nuclear fuel in order to reuse the extracted plutonium and uranium as reactor fuel in the resource-scarce country. But the policy has run into a dead end as the completion of a separate fuel reprocessing plant in Aomori Prefecture, built on the technological expertise of the Tokaimura plant, has been delayed by more than 20 years. The decommissioning cost will be shouldered by taxpayers as the Japan Atomic Energy Agency operating the Tokaimura plant, is backed by the state. Where to store the waste accumulated at the plant is undecided. In 2014, the agency decided to decommission the plant due to its aging and the huge cost to run it under stricter safety rules introduced after the 2011 Fukushima nuclear crisis. According to the plan approved by the Nuclear Regulation Authority, around 310 canisters of highly radioactive vitrified waste and some 360 cubic meters of radioactive waste are currently stored at the facility. About 770 billion yen is estimated for the disposal of such waste and decommissioning of the facility and roughly 217 billion yen for the 10-year preparation work. A judge on Thursday stopped the federal government from suspending construction of a nuclear fuel factory at the Savannah River Site atomic weapons complex near Aiken. The ruling by U.S. District Judge Michelle Childs damages federal efforts to walk away from the over-budget and behind-schedule mixed oxide fuel project, which has been on the drawing boards for more than two decades and is currently under construction. The mixed oxide fuel plant would turn excess weapons grade plutonium into fuel for commercial nuclear reactors. The U.S. Department of Energy has been trying in recent years to suspend the project, saying it is expensive and no longer necessary to dispose of the plutonium. The latest federal plan is to ship excess plutonium, a key ingredient in nuclear bombs, to a New Mexico site for disposal. Childs’ order temporarily halts the federal shutdown process until arguments can be heard in court over whether to keep the effort going. ……..
Savannah River Site Watch’s Tom Clements, an opponent of the MOX project, said he was disappointed in the judge’s ruling Thursday. Clements says the project isn’t necessary. “The judge doesn’t understand what deep trouble the project is in,’’ he said, noting that building the MOX project doesn’t necessarily mean South Carolina will get rid of all surplus plutonium at SRS. The project is about $12 billion over budget and years behind schedule, but employs hundreds of people who would be out of work if the project shuts down, boosters say. It has been touted as a way to provide new missions for SRS. COLUMBIA — It’s a familiar story in South Carolina: Nuclear contractors fail to produce a reliable schedule, start construction with just a fraction of design finished, and let pipes and other material corrode in storage under the watch of government agencies. The abandonment of two nuclear reactors at the V.C. Summer Nuclear Station generated headlines and riled state lawmakers since last summer, but 90 miles south, a similar scenario played out at the Savannah River Site near Aiken. The federal government has likely squandered more than $7 billion as they watched a project fall decades behind schedule and its final cost increase by 12 times the initial estimates. And, like V.C. Summer, the plug is being pulled. The parallels don’t end there: The debacles also shared two of the same contractors. The Savannah River project has not faced the same anger and scrutiny as the abandonment of the two nuclear reactors in Fairfield County — likely because the inflated cost of the complex project is being distributed to federal taxpayers across the country instead of 1.6 million electric customers in South Carolina. For more than a decade, the U.S. Department of Energy and its private contractors have tried to build the plant to turn Cold War-era nuclear weapons into fuel that could be used in nuclear power plants. It’s known as MOX, short for mixed oxide fuel fabrication. The project became a federal priority around the turn of the century, and was intended to be a cornerstone of the United States’ effort to reduce its aging stockpiles of nuclear weapons. But for more than four years, it has been on the federal chopping block. In federal studies and congressional testimony reviewed by The Post and Courier, government officials laid out a long list of problems with the contractors and the project in general. Two presidential administrations have tried to put an end to the costly undertaking. Each time, however, South Carolina’s powerful congressional delegation revived the project, siding with the contractors who disputed the findings of independent consultants and federal agencies. Now, it may be too late. Congress gave U.S. Energy Secretary Rick Perry the power in March to put an end to the 11-year construction effort, and the federal agency is already taking action. Earlier this month, President Donald Trump’s administration released an alternative proposal to deal with the 34 metric tons of weapons-grade plutonium that was set to be processed at the site. They estimated it will cost less than half of what it would take to finish the MOX facility and turn the plutonium into commercial fuel. The new plan calls for mixing the plutonium with another material, not revealed by the federal government, and storing it below the New Mexico desert. Buried with it could be the second major nuclear project to be cancelled in South Carolina in less than a year. ……..the companies have sunk billions into the facility that has risen out of the surrounding pines. But many of the circumstances that drove federal officials to approve the project, including the deal with Russia, have changed.So, too, have the projections for the final cost of the facility. It now stands at roughly $17 billion. A ‘horror story’ for taxpayers? U.S. Rep. Jim Cooper took direct aim as he opened a congressional oversight hearing in the fall of 2015. “I am worried that, as we enter the month of October and head toward Halloween, that really the subject of this hearing is a horror story for the American taxpayer,” said Cooper, a Democrat from Tennessee. By that time, the contractors’ forecasted price tag for the facility had jumped by more than six times the estimates from 2002. The Department of Energy estimated the cost to be even higher, and President Barack Obama’s administration was pushing to end construction altogether. …..John MacWilliams, an Associate Deputy Secretary of Energy, told the federal lawmakers one of the biggest problems was that construction began with only 20 to 25 percent of the design for the MOX facility complete. “Immature design is one of the biggest problems we face,” said MacWilliams, who led a special team that reviewed the project’s management. MacWilliams also reported that around a quarter of the rebar, pipes, electrical wiring and other material that was initially installed had to later be torn back out and replaced — slowing construction and increasing the cost of labor. Like V.C. Summer, federal officials reported materials being ruined because parts were ordered years before they were ever needed. The contractors reportedly didn’t have a “resource loaded” schedule that tied together supplies and construction work. Fifty percent of the piping that was manufactured as of 2016 was unusable due to corrosion and design changes, a report by the U.S. Army Corps of Engineers found. “This pattern of early procurement is systemic,” the report said. “I think it’s clear that although there is blame to go around on all sides the contractors from the very beginning misled the Department and for that matter the U.S. government,” MacWilliams told The Post and Courier last week. ……..Existing facilities at Savannah River are already capable of diluting the plutonium, but the federal government also wants to install new equipment to speed up the work that’s expected to continue for the next three decades. The full price tag for the process, according to a new Department of Energy analysis, could equal another $19.9 billion. By comparison, federal officials say it would take another $48 billion to complete the construction of the MOX facility, as well as finish the work of turning the plutonium into fuel. Review of nuclear fuel reprocessing plant resumes https://www3.nhk.or.jp/nhkworld/en/news/20180517_32/ Japan’s nuclear regulator has resumed its review of an under-construction nuclear fuel reprocessing plant, following a suspension of 8 months because of a maintenance problem discovered last summer. The Nuclear Regulation Authority on Thursday resumed its review of the plant in Rokkasho Village in Aomori Prefecture. The resumption came after the plant’s operator, Japan Nuclear Fuel Limited, gave notice that it has worked out a plan to introduce new safety measures. Last August, rainwater was found to have flowed into a building for emergency power generators at the plant. The rainwater leak was blamed on a failure by the company to conduct mandatory inspections of the area over a period of several years. During Thursday’s review session, Japan Nuclear Fuel explained how it will improve its maintenance programs at the plant. In response, officials from the Regulation Authority said the company should conduct a more rigorous assessment of its past maintenance work. In future review sessions, the regulator is planning to ask about the company’s contingency plans for emergencies such as the fallout of volcanic ash from a nearby volcano, or a plane crash. The company is aiming to complete the construction of the plant in 3 years. The Trump administration will abandon a nuclear energy project that was supposed to satisfy de-nuclearization treaty obligations with Russia and will instead bury diluted nuclear weapons underground. Energy experts have long pointed to bureaucratic inefficiencies holding back nuclear energy projects, but the now-abandoned Mixed Oxide, or MOX, project illustrates just how expensive building these facilities has become. Energy Secretary Rick Perry wrote to Congress in early May, detailing the administration’s plan to abandon the project. Perry wants to blend weapons-grade plutonium with inert substances and then bury them underground in New Mexico, according to a copy of the letter obtained by Reuters. The federal government has already spent about $7.6 billion on the MOX project at South Carolina’s Savannah River Site, but Perry said completing the facility meant to convert nuclear weapons into fuel would cost another $48 billion. Trump administration axes project to generate power from plutonium, Timothy Gardner, WASHINGTON (Reuters) 13 May 18 – The Trump administration plans to kill a project it says would have cost tens of billions of dollars to convert plutonium from Cold War-era nuclear bombs and burn it to generate electricity, according to a document it sent to Congress last week. Legislation passed in February allows the Energy Department to advance burying the plutonium if it showed that the cost would be less than half of completing MOX…….. The Monju fast-breeder reactor experiment yielded few sufficient results despite an investment of at least ¥1.13 trillion ($10.3 billion) worth of taxpayers money since 1994, state auditors confirmed on Friday. The trouble-plagued prototype, which only ran for 250 days, was designed to play a key role in Japan’s quest to set up a nuclear fuel recycling program, but the project only achieved 16 percent of the intended results, the Board of Audit said. The government finally decided to scrap Monju in December 2016 at an estimated additional cost of ¥375 billion. But the audit board noted that the 30-year decommissioning plan could cost even more. The reactor, which started operations in 1994, was designed to produce more plutonium than it consumes while generating electricity, experienced several problems over its more than two-decade run, including a sodium coolant leak and attempted cover-up, and equipment inspection failures. “Flawed maintenance led to the decommissioning,” the auditors concluded in their report. But the report also spotlights the absence of a systematic evaluation system for the project. During the entire experiment, the auditors expressed their opinions on Monju’s research and development costs only once — in 2011. Monju was only up and running for 250 days in total after repeatedly failing to complete test items, according to the report. As for the decommissioning costs, the report said they might expand because the current estimate does not include personnel costs and taxes. It also noted that the cost of removing the radioactive sodium coolant could change. Recycling nuclear waste is not the win-win it seems like it should be, Las Vegas Sun, Editorial, Sunday, May 6, 2018 The idea of turning Yucca Mountain into a nuclear waste reprocessing facility, which some Nevadans are proposing, sounds wonderful…. It’s expensive. Reprocessing does yield new fuel, but it costs up to 10 times more than producing conventional fuel — uranium that is mined and enriched. That being the case, the market price of reprocessed fuel is far higher than enriched uranium, so it’s not a cost-effective option for nuclear plant operators. • It doesn’t solve the transportation problem. Radioactive materials would still be shipped into Nevada, and some of the transportation routes for the waste cut through the heart of the Las Vegas Valley. This isn’t just a NIMBY issue, either, considering that the routes also pass through 43 other states. • It’s water-intensive. According to one estimate, it would require 50,000 acre-feet of water annually, or the equivalent of enough for 100,000 homes for a year. Considering that the water in the Yucca Mountain area is already over-appropriated, that’s more than would be available and far more than would be environmentally sound. • It’s dirty. 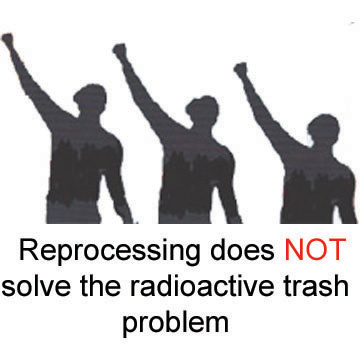 Reprocessing involves using acid to extract plutonium and recover unused uranium from irradiated uranium fuel, which results in liquid wastes teeming with radioactive and chemical poisons. The Hanford Nuclear Reservation in Washington, one of the few places in the U.S. where reprocessing for nuclear weapons production has occurred, is an environmental disaster area where $50 billion in cleanup work has been done and more than $100 billion more is needed to deal with millions of gallons of liquid waste stored in underground tanks. So while the basic idea behind reprocessing may sound like sort of a nuclear version of recycling aluminium cans or plastic bottles, it’s actually not environmentally friendly and is prohibitively costly. …… it’s a dangerous idea, not only from a health and environmental standpoint but from a political one, as well.Yucca Mountain proponents in other states would love to see a crack in Nevada’s longstanding official opposition to the repository. If they sense that the reprocessing concept has caused Nevadans to warm to the idea of bringing the nation’s waste to the state, you can bet they’ll exploit it. That’s especially true given President Donald Trump’s support of the project, for which he placed $120 million in funding to restart the licensing process in his budget. Congress rebuffed him by not including the funding in this year’s omnibus spending bill, but there’s been no indication that Trump will stop pressing. the treatment of Ukrainian used fuels VVER 1000 at the Orano la Hague site. TOKYO — Japan is set to start decommissioning its troubled Monju fast-breeder reactor after decades of accidents, cost overruns and scandals. It is the beginning of the end of a controversial project that exposed the shortcomings of the country’s nuclear policy and the government’s failure to fully explain the risks and the costs. In July, the Japan Atomic Energy Agency will begin decommissioning what was hailed as a “dream” reactor that was expected to produce more nuclear fuel than it consumed. The government has so far spent more than 1 trillion yen ($9.44 billion) on the plant, which has barely ever operated. The plan approved by the Nuclear Regulation Authority on March 28 to decommission the reactor, located in central Japan’s Fukui Prefecture, calls for the extraction of spent nuclear fuel to be completed by the end of the fiscal year through March 2023. Full decommissioning is expected to take about 30 years. Total costs to shut down the reactor are currently estimated at 375 billion yen, but that could climb, as the full technical requirements and the selection of the nuclear waste sites are not well understood. Japan does not have the technological ability to manage the decommissioning process on its own, and must enlist the help of France, which has more experience with fast-breeder reactors. Among the technical challenges is handling the plant’s sodium coolant, which is highly reactive and explodes on contact with air. Many of the problems with Japan’s nuclear policy were brought to light by the Fukushima Daiichi nuclear disaster caused by the tsunami and earthquake of March 2011. Such problems have included the high costs of plants, the selection of nuclear disposal sites, and the threat of shutdowns due to lawsuits. Japan’s nuclear policy has largely been gridlocked since the disaster. But the Monju project had many problems before the Fukushima catastrophe. Planning for the project began in the 1960s. Its fast-breeder technology was considered a dream technology for resource-poor Japan, which had been traumatized by the oil crisis of the 1970s. The reactor was supposed to generate more plutonium fuel than it consumed. The reactor finally started operating in 1994, but was forced to shut down the following year due to a sodium leak. It has been inoperative for most of the time since. The decision to decommission it was made in December 2016 following a series of safety scandals, including the revelation that many safety checks had been omitted. Recent experience suggests the government’s estimated cost of 375 billion yen to decommission Monju could be on the low side. In 2016, the estimate for decommissioning the Fukushima Daiichi plant ballooned to 8 trillion yen from an initial 2 trillion yen in 2013, largely due to inadequate understanding of the decommissioning process. While “the JAEA will try to keep costs down,” said Hajime Ito, executive director with the agency, the process of extracting sodium, the biggest hurdle, has yet to be determined. Future technical requirements will also involve significant costs. The Monju reactor is not the only example of failure in Japan’s nuclear fuel cycle policy — the cycle of how nuclear fuel is handled and processed, including disposing nuclear waste and reprocessing used fuel. Central to this policy is a nuclear fuel reprocessing plant in the village of Rokkasho in northern Aomori Prefecture that was supposed to extract plutonium and uranium by reprocessing spent nuclear fuel to be reused at nuclear plants. More than 2 trillion yen has been spent on the plant so far. Construction was begun in 1993, but completion has been repeatedly postponed due to safety concerns. On Wednesday, the NRA decided to resume safety checks on the plant, but if it chooses to decommission it, the cost would be an estimated 1.5 trillion yen. Had Japan taken into consideration the costs of decommissioning plants and disposing of spent nuclear fuel, it probably would not have been able to push ahead with its nuclear policy in the first place, said a former senior official of the Ministry of Economy, Trade and Industry, who was involved in formulating the country’s basic energy plan. The Department of Energy’s budget request for fiscal 2019 asks for money to close the Mixed Oxide Fuel Fabrication Facility and says the agency prefers the “dilute and dispose” method to dispose of 34 metric tons of weapons-grade plutonium. The budget request seeks $1.7 billion — $287 million more than last year — to provide support at Savannah River Site for the Liquid Tank Waste Management Program, including “a significant increase” in the production at the Defense Waste Processing Facility and startup of the Salt Waste Processing Facility, according to a DOE fact sheet released Monday.